Do you want the wow factor in your new bathroom? Achieving a sleek and glamorous bathroom renovation takes good planning and communication between the homeowner and their bathroom renovation specialists. Careful selection of bathroom products, high-end finishing and attention to detail is also critical. 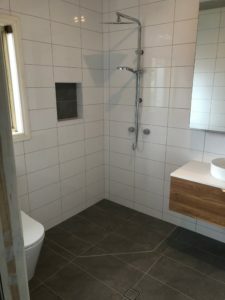 The team at Back2Life Bathrooms are the experts at Bathroom Renovations in Brisbane. 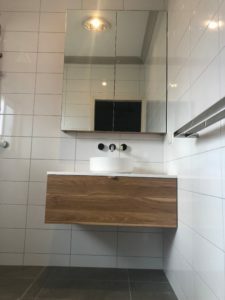 They work carefully with clients to capture ideas and concepts helping them through the tricky decision-making process to ensure they achieve their dream bathroom. This beautiful bathroom in Norman Park is a wonderful example of what can be achieved. The end result is classy and timeless. The wall-hung vanity with shaving cabinet, floor to ceiling tiling and use of a light grey grout to make tiles stand-out provide a very contemporary look. Replacing 90mm cornice to sit over the tiles gave an extra high-quality finish. 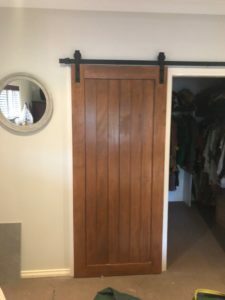 The existing hinged door was replaced with an external, sliding barn door to create extra space and add to the overall story. Floor to ceiling tiles with light grey grout. Stunning. Wall-hung vanities are sleek and practical. Back2Life Bathrooms get 5-star review!